PASADENA, California -- Glacial melting on a section of the West Antarctic Ice Sheet has passed the point of no return, according to NASA scientists. Researchers say that a new study presents multiple lines of evidence, incorporating 40 years of observations, that indicate the glaciers in the Amundsen Sea sector of West Antarctica are in an irrevisable decline. 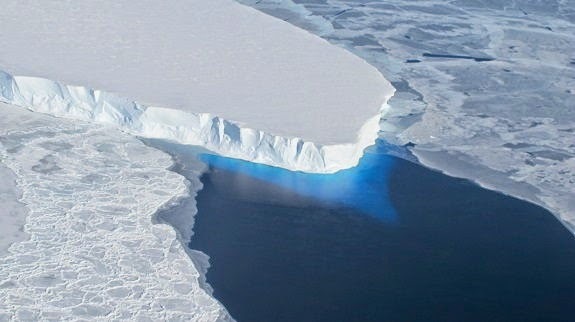 According to NASA, that these glaciers already contribute significantly to sea level rise, releasing almost as much ice into the ocean annually as the entire Greenland Ice Sheet. They contain enough ice to raise global sea level by 4 feet (1.2 meters) and are melting faster than most scientists had expected. Eric Rignot, of UC Irvine and NASA's Jet Propulsion Laboratory said these findings will require an upward revision to current predictions of sea level rise. "This sector will be a major contributor to sea level rise in the decades and centuries to come," Rignot said. "A conservative estimate is it could take several centuries for all of the ice to flow into the sea." "The collapse of this sector of West Antarctica appears to be unstoppable," Rignot said. "The fact that the retreat is happening simultaneously over a large sector suggests it was triggered by a common cause, such as an increase in the amount of ocean heat beneath the floating sections of the glaciers. At this point, the end of this sector appears to be inevitable."